Nine at Mary Brickell Village condominiums is a 34-story residential tower situated atop the 200,000-square-foot shopping and dining destination called The Shops at Mary Brickell Village. Completed in 2015, Nine at Mary Brickell Village was developed by LYND & Starwood Capital and designed by Behar Font & Associates. The interior designer of Nine at Mary Brickell Village was Nick Luaces Design Associates. Nine at Mary Brickell Village has 390 condo residences comprised of one-, two-, and three-bedroom floor plans ranging in size from 744 to 2,098 interior square feet plus balcony (see Nine at Mary Brickell Village floor plans). It has a total of 30 different floor plans. The condo residences at Nine at Mary Brickell Village boast beautifully appointed kitchens with stainless steel appliances, 9- to 11-foot high ceilings, quartz countertops and backsplashes, designer fixtures and hardware, oversized mirrors, spacious walk-in closets, and large soaking tubs. The building amenities at Nine at Mary Brickell Village include a state-of-the-art fitness center, resort-style swimming pool, club room, BBQ area, concierge, and complimentary Wi-Fi in all indoor and outdoor amenity spaces. 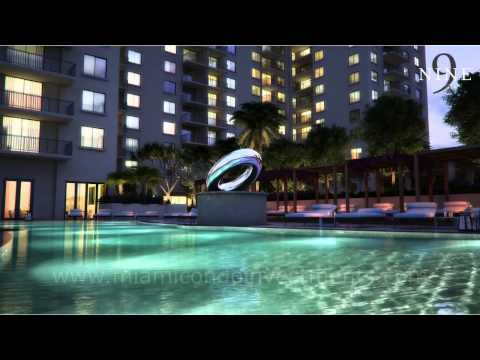 Nine at Mary Brickell Village condominiums is located in Brickell Miami at 999 SW 1st Ave. Its convenient location puts residents just an elevator’s ride from a Publix grocery store; LA Fitness health club; Blue Martini lounge, bar, and nightclub; as well as a number of excellent restaurants and shops. Additionally, Nine at Mary Brickell Village is just two blocks from the upscale shops, restaurants, and entertainment at Brickell City Centre. By car, Nine at Mary Brickell Village is 8 minutes from Downtown Miami, 18 minutes from South Beach and 30 minutes from the Miami International Airport. What is the pet policy for owners and renters at Nine at Mary Brickell Village? Nine at Mary Brickell Village is a pet-friendly condo development for both owners and renters. There are no weight restrictions. Prior to move-in, tenants who are pet owners must pay a non-refundable pet fee of $150 to the condo association. Which utilities are included in the Nine at Mary Brickell Village condominium association dues? What are the rental restrictions for Nine at Mary Brickell Village condo?